Male breast cancer (MBC) is a rare malignant disease, accounting for <1 % of all breast cancers (BCs). Treatment of men with early-stage BC is based on standards established in female BC. 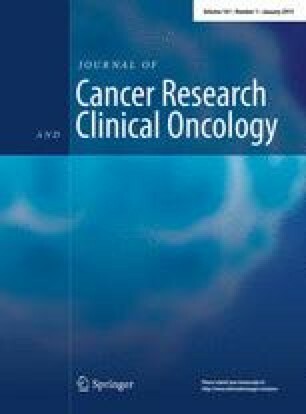 Prognostic or predictive markers to guide therapeutic decisions, in particular in early-stage male BC, are missing. Here, we explored whether disseminated tumor cells (DTC) in bone marrow (BM) and circulating tumor cells (CTC) in blood could be suitable biomarkers in male BC. Five male patients (pT2–4, pN0–2, M0) with hormone receptor-positive, HER2-negative, and ductal primary BC (median age 70 years, range 51–73) were enrolled in a prospective study of patients with early-stage breast cancer. Here, we analyze the male subgroup. DTC in BM were analyzed before therapy and identified by immunocytochemistry using the pancytokeratin antibody A45B/B3. Blood samples (10 ml) were analyzed for CTC using the AdnaTest BreastCancer (AdnaGen AG, Langenhagen, Germany). DTC were found in three out of five male patients (60 %) with two DTC detected in one patient and one DTC detected in each of the other two patients. This is compared to a detection rate of 25–40 % in pooled analyses of female patients. CTC were only found in one of five patients. After a median follow-up time of 3 years (range 1–10 years), all patients were still alive and free of relapse. The prevalence of DTC and CTC in male BC seems comparable with female BC. No prognostic relevance could be documented in this small population. A prospective study or at least larger cases series will be required to assess the prognostic or predictive value of DTC and CTC in this rare disease.